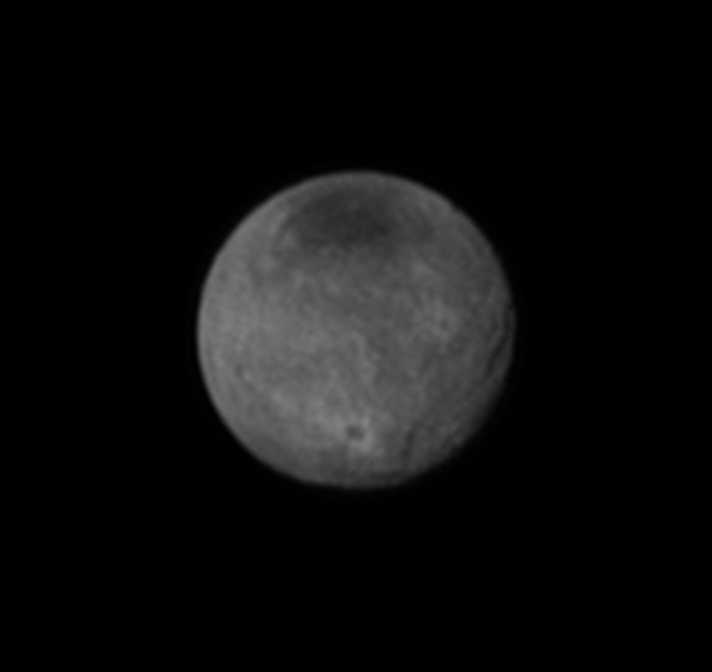 Chasms, craters, and a dark north polar region are revealed in this image of Pluto’s largest moon Charon taken by New Horizons on July 11, 2015. This annotated version includes a diagram showing Charon's north pole, equator, and central meridian, with the features highlighted. New Horizons' newest images reveal Pluto's largest moon Charon to be a world of chasms and craters. The most pronounced chasm, which lies in the southern hemisphere, is longer and miles deeper than Earth's Grand Canyon, according to William McKinnon, deputy lead scientist with New Horizon's Geology and Geophysics investigation team. 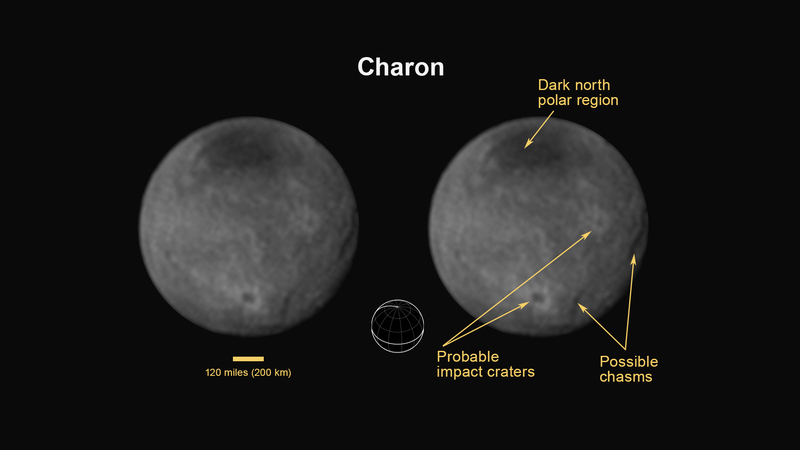 "This is the first clear evidence of faulting and surface disruption on Charon," says McKinnon, who is based at the Washington University in St. Louis. "New Horizons has transformed our view of this distant moon from a nearly featureless ball of ice to a world displaying all kinds of geologic activity." The most prominent crater, which lies near the south pole of Charon in an image taken July 11 and radioed to Earth today, is about 60 miles across. The brightness of the rays of material blasted out of the crater suggest it formed relatively recently in geologic terms, during a collision with a small Kuiper Belt Object (KBO) some time in the last billion years. The darkness of the crater's floor is especially intriguing, says McKinnon. One explanation is that the crater has exposed a different type of icy material than the more reflective ices that lie on the surface. Another possibility is that the ice in the crater floor is the same material as its surroundings but has a larger ice grain size, which reflects less sunlight. In this scenario, the impactor that gouged the crater melted the ice in the crater floor, which then refroze into larger grains. A mysterious dark region near Charon's north pole stretches for 200 miles. More detailed images that New Horizons will take around the time of closest approach to the moon on July 14 may provide hints about the dark region's origin.